Mario Highway is a racecourse in Mario Kart Arcade GP and Mario Kart Arcade GP 2. Blimps can be seen flying around the track. Sculptures of Mario and Luigi's heads can be seen on the side of the mountain near the tunnel, which is much like Mount Rushmore. 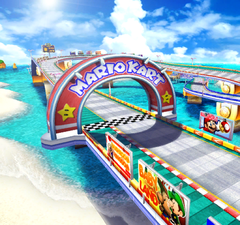 Overlooking this track is what appears to be Corona Mountain, suggesting that this track takes place on Isle Delfino. It starts at one of the straightest parts of the track; then curves at one of the tightest turns of the track. This leads the players to a tunnel with water at the sides to slow down players. The tunnel turns sharply to the right and leads to the finish line. This track is also the course the characters are racing on for the title art of the game. In Mario Kart Arcade GP DX, the course is redesigned into Splash Circuit. This page was last edited on November 12, 2018, at 23:37.